To celebrate the old saying that oysters should only be consumed in months containing the letter "r" (not that I live by that rule, by any means), I slurped down a half dozen Malpeques and Blue Points at J.Paul's after an errand in Georgetown. Most of us ignore the summer oyster blackout, but where did the whole thing originate? The Internet seems to blame a certain William Butler ... or Richard Buttes ... or Henry Butts ... well, the Internet can't seem to agree on the guy's name. Let's just say someone wrote in Diet's (or was it Dyet's?) Dry Dinner in 1599 something along the lines of: The oyster is unseasonable and unwholesome in all months that have not the letter R in their name. Theories about this supposed unwholesomeness abound. Connoisseurs of taste claim that spawning oysters don't taste as good, and they spawn in the summer when the water warms up. Some say the claim dates from pre-refrigeration days. Another theory claims that the European oyster is to blame because it holds its offspring (during summer) inside until they form tiny shells, making for gritty eats. 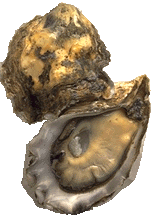 MYTH: Avoid raw oysters in months without the letter "R" and you'll be safe. Fact: While presence of Vibrio vulnificus bacteria is higher in warmer months, according to the Department of Health and Human Service's Centers for Disease Control and Prevention (CDC), a full 40 percent of cases occur during colder months from September through April. But even the Debbie Downer government won't make me stop loving the oyster. Tops on my list of places to enjoy a dozen or two are Hank's Oyster Bar and Old Ebbitt. Where do get your fix? Oysters spawn during the summer and are hence smaller and tougher. They're big and juicy towards the fall months. Either way, a healthy dose of lemon juice and Tabasco will burn off most of the little parasite critters. I'll just enjoy East Coast oysters this year! I was just at Penn Cove Shellfish's farm on Whidbey Island and learned a bunch about mussels and oysters. Here's the good news - many oysters being harvested today are "sexless" in other words they don't spawn (sort of the donkey of shellfish) - here's a direct quote about triploid oysters from Wikipedia: "if they're bred as Triploid oysters have been genetically altered so that they are reproductively inactive—virtually sterile. As a result, they attain larger size than normal, or diploid, strains. And because triploids don't undergo the transformations associated with reproduction that make diploid oysters unpalatable during the summer months, they can be marketed all year round. The old adage about not eating oysters in months without an "r" in their name--which probably arose from the fact that diploid oysters become "mushy" during the reproductive phase--doesn't apply to triploids. Bit more detail - plants and animals need energy to perform tasks - include spawning as an energy intense task - and thus they burn up fat stores to mate and raise kiddies - this means they have no fat - fat=flavor - and tend to be watery and thin during the Summer "active" months. Bacteria/disease is a separate issue... Triploid's don't mate/spawn - so eat them 12 months out of the year!! Give it up for the triploids! Childe Harold in Dupont used to be my favorite for Oysters Rockafeller, but I think they may have been having an off night last time I had them, because they were awful. I find the Government's advice amusing: There's no reason to avoid summer oysters, because 60% of annual cases occur within that four month span in the summer. I had some plain, fat Gulf oysters this past weekend. A little nervous because of the heat, even though it was an "-r" month. Amazing to grow up on those bland monsters and then experience Malpeques, Wellfleets, etc.